If there was any team to fear going into the quarter-finals round for undefeated Russia then France surely was that one team. France delivered three upsets through the preliminary round on their way to qualifying for the quarter-finals but today’s matchup against Russia would prove to be one tall task. 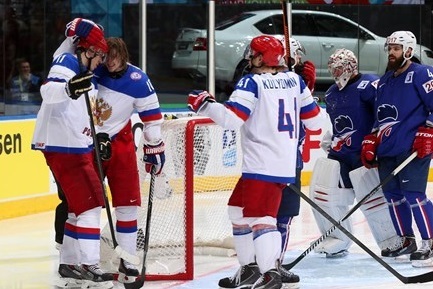 Russia dominated play as it did through most of their first seven games and went on to shutout France 3-0 to move on to the semi-finals where they will take on last year’s defending gold champion, Sweden. Alexander Ovechkin returned for today’s game after suffering an injury in Russia’s sixth preliminary game against Germany. Ovechkin sat out Russia’s game against Belarus giving him extra time to rest up to play against France but was held scoreless in the game. Meanwhile Evgeni Malkin knotted a goal and picked up an assist in today’s game as Russia scored a goal in each period along their way to victory. It’s never easy staying undefeated for as long as Russia has and if they plan to play for the gold medal then Russia will have to win their ninth straight game. Sweden however has been one of the most consistent teams even when they have had not so great periods against weaker opponents through the tournament. With Canada knocked out for their fifth straight year in the quarter-finals, it wouldn’t be far-fetched to say that the winner beaten Russia and Sweden could very much go on to win it all this year. However on the opposing end Finland’s slow start and the Czech Republic’s lack of finishing teams will either come back to haunt them or be a thing in the past if either team goes the distance.